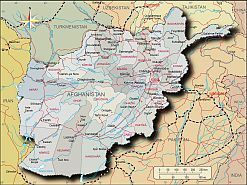 Editable royalty-free map of Afghanistan in vector-graphic online store. 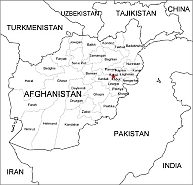 Afghanistan is a landlocked nation in south-central Asia. Strategically located at the crossroads of major north-south and east-west trade routes, it has attracted a succession of invaders ranging from Alexander the Great, in the fourth century B.C to the Soviet Union in the twentieth century A.D. 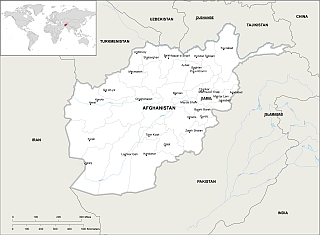 Almost as large as the state of Texas, Afghanistan is bounded by six different countries. Afghanistan’s longest border—accounting for its entire southern boundary and most of its eastern one—is with Pakistan. The shortest one, bordering China’s Xinjiang province, is a mere 47 mi (76 km) at the end of the Vakhan corridor, a narrow sliver of land 150 mi (241 km) long that extends eastward between Tajikistan and Pakistan. At its narrowest point it is only 7 mi (11 km) wide.The Hindu Kush mountains, running northeast to southwest across the country, divide it into three major regions: 1) the Central Highlands, which form part of the Himalayan Mountains and account for roughly twothirds of the country’s area; 2) the Southwestern Plateau, which accounts for one-fourth of the land; and 3) the smaller Northern Plains area, which contains the country’s most fertile soil. 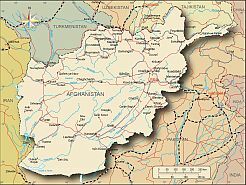 Afghanistan is landlocked, with the closest seacoast roughly 300 mi (483 km) away in Pakistan, on the shores of the Arabian Sea. Afghanistan has a semiarid to arid climate with wide variations in temperature, both between seasons and between different times of day. Its summers are hot and dry, but its winters are bitterly cold. Recorded temperatures have ranged as high as 128°F (53°C) in the deserts, and as low as -15°F (-26°C) in the central highlands, which have a subarctic climate. Summertime temperatures in the capital city of Kabul can vary from 61°F (16°C) at sunrise to 100°F (38°C) by noon. 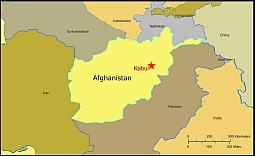 The mean January temperature in Kabul is 32°F (0°C). monsoons can bring heavy rains in the southeastern mountains in July and August. Otherwise, Afghan summers are generally dry, cloudless, and hot. Humid air from the Persian Gulf sometimes produces summer showers and thunderstorms in the southwest.